A lot of people forget just how big Huey Lewis and the News were in the 80's. The band was formed in 1978 by members of San Francisco bay area groups Clover and Soundhole. Originally called Huey Lewis and the American Express, they changed their name to the News at the instance of Chrysalis Records when they signed in 1979. Their first album, 1980's Huey Lewis and the News, did not chart but their second, 1982's Picture This went to number 13 on the strength of the hit Do You Believe in Love (1982 / #7) and set the band up for the rest of the 80's when they would have two number 1 albums (Sports (1982), Fore! (1986)) and eleven more top ten hits including the number 1's The Power of Love (1985), Stuck With You (1986) and Jacob's Ladder (1987). Huey Lewis and the News will release a three-CD compilation of music from throughout their career on August 29 with Collected; however, it will only be available in the Netherlands for a short time. The band's website says that "It will be available on Amazon worldwide soon after." Discs 1 and 2 travel through the band's nine studio albums and two soundtracks to which they contributed. 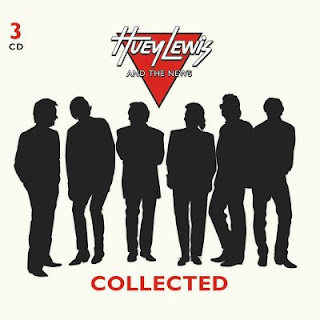 Disc 3 is full of rarities from pre-Huey Lewis and the News bands, Lewis solo, dance versions, remixes and other rarities.